Our 527 members work fewer hours, with clients they love, at higher hourly rates and with better work/life balance. You should too. The system that business coach and entrepreneur Peter Cook and bookkeeper Debbie Roberts created over a decade in her bookkeeping business. The System that took her from a sole trader to having a successful business and a team of twelve bookkeepers. The System that is now available to help bookkeepers like you transform their business. 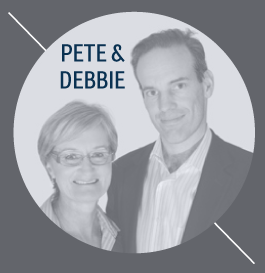 The Pure Bookkeeping System represents over a decade of blood sweat and tears from Debbie in her business, with Pete’s constant guidance. It’s currently in its 10th version. Every part of it has been tested, pulled apart, improved and put back together. This isn’t something we’ve put together on a whim, or because we’ve seen a market opportunity. It’s something we’ve been building and using for over a decade, which is why we are so confident it will work for you. When it comes to running a successful bookkeeping business, the bookkeeping is the easy part! Many bookkeepers have faced the challenges of marketing, and finding great clients. And those of us that manage to jump that hurdle then find we’re facing a whole new set of challenges: long hours, ever-dwindling time for friends and family, and how to earn the rates we deserve. I’m Debbie Roberts, a fellow bookkeeper. I’ve been in your shoes. Back in 2001 I was facing all those challenges. “BAS-ON” (as my husband calls it) was crazy. I didn’t see my family, I was working long hours but I still wasn’t getting the financial rewards I deserved. Then I started working with business coach Peter Cook. As a result, I made a series of important changes. Some were easy to make. Others were more difficult. However, I successfully made the changes I needed to make. The result? By 2010, I had a successful team of 12 bookkeepers. I enjoyed sensible hours. My personal income more than trebled and I worked with a much higher calibre of clients. Today, I enjoy a long annual holiday—with no worries about running my bookkeeping business. You can discover more about my story and the secrets of my success by taking part in our free online training. My business coach, Peter Cook, pulls apart what we have done that has worked, and also shares some of the mistakes we’ve made so you can avoid them. Successfully Used By 527 Bookkeepers… and Counting! © Pure Bookkeeping. All Rights Reserved.